IT’S ALL ABOUT THE VIEW, LOCATION and the WOW! Enjoy long water views and sunset skies from the entry, great room, family room, kitchen, master suite and pool area. LOCATION - waterfront home located on one of the limited and most coveted sites with no bridges into the Gulf. This desired southwest exposure .43 acre corner lot is a short stroll to the private Moorings Property Owners Beach on the Gulf of Mexico. THE WOW! This award-winning home by architect Andrea Clark Brown was designed especially for the site with almost 3200 square feet of flowing design, vaulting ceilings, warm wood floors and French doors and disappearing sliders opening to the pool and screened lanai for formal as well as casual entertaining. Morning light is captured in the kitchen and breezes flow from the kitchen windows to the screened side entry doors. 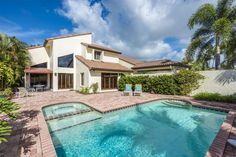 35’ long pool, 3 car garage, three bedrooms plus den/fourth bedroom, three full baths plus one half bath, his and her master walk-in closets and abundant storage. Priced below recent appraisal. 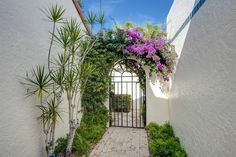 From the gated courtyard entry with 24’ walls open to the sky creating dramatic shadows to the sparkling water of Bowline Bay, this home is special.